By tetrapodzoology on May 12, 2011. Fossils demonstrate beyond any doubt that Mesozoic dinosaurs laid eggs, as of course do all dinosaurs today. But back during the 1960s, 70s and 80s - back when Robert Bakker and his idea about dinosaur biology were regularly featured in magazines and other popular sources - the scientific community was (sarcasm alert) delighted and enthralled by Bakker's proposal of sauropod viviparity. Yes, mostly forgotten today is the idea that sauropod mothers were once suggested to give birth to a single, live, proportionally large baby, and to then engage in protracted parental care. While Bakker is typically associated with this idea, it seems to have first been suggested by William Diller Matthew in 1910. Like many other palaeontologists of the time, Matthew assumed (very wrongly) that sauropods were amphibious or aquatic, and it was within this context that he proposed the possibility of sauropod viviparity (Matthew 1910). The thinking here was that viviparity would eliminate the need to lay eggs on land and hence allow a fully aquatic lifestyle. Copious evidence now shows that sauropods were strongly terrestrial - at best being about as 'aquatic' as are rhinos or elephants - and thus Matthew's proposal can be completely ignored. Bakker's hypothesis was made within the paradigm of sauropod terrestriality. Let's note from the start that there's nothing obviously, inherently 'wrong' with his idea: viviparity, and substantial maternal investment in juvenile body size and parental care have all evolved elsewhere in non-avian reptiles. Nevertheless, the idea that sauropods were K-selected, elephant-style breeders with a very low reproductive turnover is totally at odds with the bulk of our knowledge on dinosaur biology, much of which indicates that dinosaurs were r-selected animals with large clutches, high juvenile mortality and perhaps little to no post-hatching parental care (e.g., Janis & Carrano 1992, Varricchio 2011). -- Bakker (1986, p. 357) mentioned a supposed 'newborn' Apatosaurus (estimated to weigh c. 230 kg), said to be too big to have hatched from an egg. His scaled diagram of this specimen - from Bakker (1986) - is shown below. -- The pelvic canal in sauropods looks wide. Maybe, he said, this is because they gave birth to relatively big babies (Bakker 1986, p. 357). -- Desmond (1975) noted that - due to physical constraints acting on the maximum sizes of shelled eggs - the babies of an oviparous sauropod would be tiny compared to adults. Such tiny animals wouldn't be able to "find their way to the herd", and their size would mean that they'd surely be crushed underfoot by their gigantic parents. Ergo, relatively big babies, born live in the middle of the herd (a 'reptilian elephant' model), were the answer (Desmond 1975, p. 132). -- On the existence of the 'newborn': how do we know it's a 'newborn'? We don't. Other sauropod babies (read on) are substantially smaller than c. 230 kg, so it seems more parsimonious to assume that the c. 230 kg juvenile had been growing for some unknown postnatal period. -- On the wide pelvic canal, this could be present because sauropods have really wide pelves (for reasons unconnected to the production of eggs and/or babies), and I'm not sure that sauropods do have particularly wide pelvic canals when compared with other oviparous reptiles anyway. -- Finally, the behavioural scenario discussed by Desmond (1975) is entirely speculative and relies on the assumption that sauropod babies required 'herd protection'. We actually have good reason to think that baby sauropods (and other baby dinosaurs too) lived independently of adults (e.g., Varricchio 2011). Another possible objection to the concept of sauropod viviparity is that archosaurs are unable to evolve this parturition strategy (Hopson 1977). That is, some people have argued that archosaurs are incapable of evolving viviparity: it's been said that developing archosaur embryos rely on the eggshell as a calcium reservoir and cannot therefore dispense with it (Hopson 1977, Packard et al. 1977, Tarsitano 1982), and also that limited oxygen exchange in the archosaur uterus prevents extended embryonic development (Andrews & Mathies 2000). Indeed, we don't know of any confirmed cases of viviparity in archosaurs, though its possible presence has been suggested at times for hesperornithine birds, metriorhynchoid crocodilians, pachycephalosaurian ornithischians and pterosaurs. The definitive killer point on the whole viviparous sauropod idea comes from the discovery of numerous definitive sauropod eggs and embryos. It's true that many Cretaceous eggs traditionally identified as those of sauropods* have never been shown beyond doubt to belong to these dinosaurs, but there are now many, many others. At Auca Mahuevo in Argentina, "over a dozen in situ eggs and nearly 40 egg fragments encasing embryonic material were recovered" (Chiappe et al. 1998, p. 258). Six more Auca Mahuevo eggs - this time revealing well-preserved, near-complete skulls - were published a few years later (Chiappe et al. 2001, Salgado et al. 2005) [embryonic Auca Mahuevo sauropod skulls shown here, from Chiappe et al. (2001)]. More recently, sauropod hatchlings discovered right next to hatched and unhatched eggs (oh, and preserved with the large snake Sanajeh indicus as well) have been reported from the Upper Cretaceous of India (Wilson et al. 2010) (the snake was evidently preying on the babies). * The French 'Hypselosaurus eggs' are the best case. These eggs and embryos do only belong to one sauropod group (Titanosauria), but we also have eggs and embryos from close relatives of sauropods (e.g., Reisz et al. 2005) and from elsewhere in Saurischia and Dinosauria. The principle of parsimony demands that egg-laying must be assumed for all sauropods in the absence of compelling evidence to the contrary. What drew me to write about this topic in the first place is the artwork. The best known picture depicting sauropod viviparity is Doug Henderson's painting - shown here - where a mother Apatosaurus is craning her neck round to look at her newborn baby. Unfortunately, what you see here is cropped. In the full-size version (which I don't seem to have anywhere*), what appears to be afterbirth is obviously present next to the baby (here, you can just see part of it overlapping the baby's tail). Incidentally, can you spot the technical error in the illustration? I mean, besides the brand new, just-born baby and all that. Yes, if you've spent years staring at the back ends of reptiles you'll note that the mother sauropod has been given a transverse cloacal slit, as if it's a squamate. In keeping with crocodilians, it should really have been given a longitudinally aligned slit. * UPDATE: thanks to kind courtesy of Jerry Harris, the full image is now shown below. I hadn't realised that the version I use here is switched relative to the original. The other painting - quite probably inspired by, or based on, Henderson's - is by John Bindon and appeared in a children's book called Dinosaur Mysteries (1989, Hamlyn), written by Mary O'Neill. It's shown here. The human is meant to be Robert Bakker. Ok, so, I'm only aware of two relevant illustrations, but I always find it interesting when a minority scientific opinion becomes encapsulated in an illustration (other examples: non-avian theropods climbing trees, ceratopsians with frills embedded within their neck musculature). As others have noted, this can sometimes have the effect of 'reinforcing' a hypothesis - of making it look more plausible, or more widely accepted than it is, especially if the art is good. In reality, it's just art. On that note, while you might think that the idea of sauropod viviparity is dead and now well off the radar, it kinda lives on. I say this because several artistic reconstructions - and a particularly well known North American museum mount - show an adult (presumably female) sauropod guarding or in some way interacting with a single, well-cared-for baby. Most viewers are going to assume from such works that sauropods exhibited elephant-like reproductive behaviour. Viviparity might not be assumed by a naÃ¯ve observer, but it might. I would, anyway, go as far as saying that such reconstructions (which - don't get me wrong - I like very much) are flat-out misleading, and inaccurate. Even supposing that sauropods did practise extensive post-hatching parental care (note that there's no evidence for this), we know that they produced big clutches, so a dutiful parent wouldn't be looking after a single baby. Well, not unless all the other babies had been eaten. And, yes, this whole article is indeed a spin-off of one brief aside in the April 1st mokele-mbembe article. I am amused to see that some cryptozoologists who support the existence of the mokele-mbembe are aware of the viviparity hypothesis and suggest that mokele-mbembe likely practises this behaviour too. Meh. - . 1986. The Dinosaur Heresies. Penguin Books, London. Chiappe, L. M., Coria, R. A., Dingus, L., Jackson, F., Chinsamy, A. & Fox, M. 1998. Sauropod dinosaur embryos from the Late Cretaceous of Patagonia. Nature 396, 258-261. Desmond, A. J. 1975. The Hot-Blooded Dinosaurs: A Revolution in Palaeontology. Blond & Briggs, London. Janis, C. M. & Carrano, M. 1992. Scaling of reproductive turnover in archosaurs and mammals: why are large terrestrial mammals so rare? Annales Zoologici Fennici 28, 201-216. Hopson, J. A. 1977. Relative brain size and behaviour in archosaurian reptiles. Annual Review of Ecology and Systematics 8, 429-448. Matthew, W. D. 1910. The pose of sauropodous dinosaurs. American Naturalist 44, 547-560. Packard, G. C., Tracy, C. R. & Roth, J. J. 1977. The physiological ecology of reptilian eggs and embryos, and the evolution of viviparity within the class Reptilia. Biology Review 52, 71-105. Salgado, L., Coria, R.A. & Chiappe, L.M. 2005. Osteology of the sauropod embryos from the Upper Cretaceous of Patagonia. Acta Palaeontologica Polonica 50, 79-92. Tarsitano, S. F. 1982. A model for the origin of ichthyosaurs. Neues Jahrbuch fÃ¼r Geologie und PalÃ¤ontologie 164, 143-145. Varricchio, D. J. 2011. A distinct dinosaur life history? Historical Biology 23, 91-107. Maybe it's actually Jesus in a cowboy hat. Wait, aboreal non-avian dinosaurs are a fringe theory? Aw man... I was getting to like the idea of a Balaur pouncing on prey like a jaguar. No arborial non-avian theropods? That can't be because that would nix my vision of T-rex perched in a particularly stout tree waiting to drop onto Triceratops passing below and, in the words of Calvin that would be so bogus. Cool article, even if the inspiration was a pile of speculation all the way down. It's an ill wind that blows no man any good. At this point, I've come to suspect that nobody could manage any article no matter how empty, stupid or absurd about any tetrapod real or imagined that you could not turn into an interesting and informative blog post. When Matthew was suggesting a fully aquatic lifestyle, just how fully was he imagining? Like a seal? Like a whale? I don't think that's a viviparous-with-true-placenta-style "afterbirth" there in the Henderson painting so much as a modified-ovoviviparous-shell-less egg-style caul or amniotic sac like some snakes are born in. "That is, some people have argued that archosaurs are incapable of evolving viviparity: it's been said that developing archosaur embryos rely on the eggshell as a calcium reservoir and cannot therefore dispense with it (Hopson 1977, Packard et al. 1977, Tarsitano 1982), and also that limited oxygen exchange in the archosaur uterus prevents extended embryonic development (Andrews & Mathies 2000)." Is this why there are no viviparous birds? How widespread is true viviparity actually? Do some sharks have real placentas? What about Ichthyosaurs? Valagos -- well, "Walking With Dinosaurs" (which wasn't totally accurate, of course, but did its best) suggested that the young survived in small groups in the forest, then migrated out of the forest once they'd outgrown it and joined the nearest available adult herd. They didn't suggest any sort of family matching behavior, so such a herd would likely have quite diverse genetics, but it might be possible that they'd sniff out relatives or something. Is there any real evidence to even support the idea of sauropod herds, though? I ask because I'm a software engineer, not a palentologist, and thus do not know. ;-) They might live more like rhinos, which are basically solitary. In this case, finding a herd wouldn't be an issue. They'd just have to find mates occasionally. Well, there's some evidence from juvenile ceratopsids and ankylosaurs that juveniles stuck together, although that might not translate to sauropods. BTW - what became of this trackway of a herd of juvenile Apatosaurus running bipedally? Re: comment 12... it hasn't yet been published, only reported online (and it's not a herd). There is substantial scepticism, but stay tuned. Wait, now. There is *some* evidence for non-avian theropod parental care. Since it's known both in crocodylians and in avian theropods, our friend the principle of parsimony suggests that it should be widespread in archosaurs. Whether there's any fossil evidence one way or another is unclear to me, but you might write a post about it. And what's wrong with arboreal non-avian theropods? Is Epidendrosaurus mistakenly named? What about Microraptor? I don't keep up so much with all these pan-Aves types, so you will have to enlighten me. I want to hear more about vivaparity in archeosaurs! "These eggs and embryos do only belong to one sauropod group (Titanosauria)..."
Amusingly, titanosaurs have the widest pelvis of any sauropods. Have there actually been studies in e.g. lizards showing viviparous forms have wider pelvic canals, or is this another one of those "sounds rational but never tested" ideas that paleontology seems rife with? 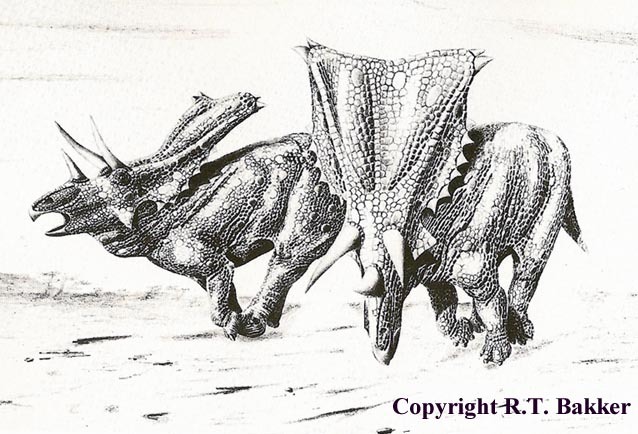 Off-topic, but the charging Triceratops on the cover of Adrian Desmond's book remind me a lot of the charging Chasmosaurus drawn by Robert Bakker. "and a particularly well known North American museum mount - show an adult (presumably female) sauropod guarding or in some way interacting with a single, well-cared-for baby"
--I assume you have in mind the rearing Barosazurus defending its young from an Allosaurus in the Cental Park West entrance hall to the AMNH in New York (which is echoed by the life-size model diorama in the orientation room of the fossil vertebrate halls on the fourth floor)? Marvelously dramatic mount for a hall with a very high ceiling, but if I recall described (by the AMNH's people themselves) as "speculative" right from the start. >"Doug Henderson's painting - shown here - where a mother Apatosaurus is craning her neck round"
Is the degree of craning shown in that painting currently thought to be excessive? I've been going through old SV-POW articles and I can't seem to find a definite answer. Mike- "That can't be because that would nix my vision of T-rex perched in a particularly stout tree waiting to drop onto Triceratops passing below"
Jurassic Park clearly supports this; the T. rex is seen eating the goat, and then when the fence collapses, and the car is shoved through - fifty foot drop on the other side! Clearly, T. rex was eating the goat *while perched in a tree*. (The main argument as to why they would feed in this manner would be "to avoid the menacing gorgonopsians that roamed the ground"). -- In making mildly dismissive comments about 'non-avian theropods climbing trees' (comment 4), I wasn't referring to all non-avian theropods, just the ones where scansoriality has been suggested but is not widely accepted. You know: ostrich dinosaurs, compsognathids, big dromaeosaurids and so on. The sort of stuff I discussed in A quick history of tree-climbing dinosaurs. I do think that such animals as scansoriopterygids and microraptorines were at least facultative climbers. -- How aquatic was Matthew imagining sauropods to be? (comment 5). Like other proponents of the aquatic sauropod model, he was thinking that they were about as aquatic as, say, freshwater turtles. Feeding and foraging in water, but maybe walking out onto land to bask or to move to a new pool. It's still not impossible that some sauropods were amphibious like hippos, but this doesn't work for any of the forms classically imagined to be amphibious - diplodocoids and brachiosaurs for example. -- I suppose the translucent 'afterbirth' shown in the Doug Henderson painting could perhaps be an amniotic sac (comment 6), yes. Bakker never said anything about the presence of any sort of placenta, but his reference to viviparity (rather than ovoviparity/ovoviviparity*) made me think that he assumed placentation of some type. * I hate the inconsistency that afflicts these terms. -- True viviparity (comment 9). In extant non-avian reptiles, complex, true placentation is definitely present in viviparous skinks and xantusiids. In some Mabuya skinks, the degree of matrotrophy is mammal-like, with the embryo receiving more than 99% of its mass by direct nutrient transfer from the mother. -- Parental care and juvenile behaviour (comments 10, 11 and 14). At the moment, the evidence for post-hatching parental care in Mesozoic dinosaurs is rather poor, though extended nest residence in hadrosaurs and ceratopsians (Brachyceratops) indicates parental care of nest-bound juveniles and adult-juvenile associations in Psittacosaurus and Oryctodromeus confirms adult care of babies in these taxa. It mostly seems that Mesozoic dinosaurs were precocial, with evidence from tracks and associated juvenile skeletons suggesting that juveniles formed 'pods' and lived separately from adults. Associated trackways of juvenile sauropods are on record, and associations of juveniles are known for such groups as ostrich dinosaurs (Sinornithomimus), therizinosaurs (Falcarius), ankylosaurs (Pinacosaurus), tenontosaurs, hadrosaurs, psittacosaurs and ceratopsids. Accordingly, there may have been little or no post-hatching association between adults and juveniles in many dinosaurs. There are hints of more complex interactions here and there, but we typically need better evidence. I have never seen the nonsensical "ovoviparity". It must be a one-off typo. OK, here's an intriguing hypothesis for you: everyone assumes that big theropod predators like T. rex and the like were mostly solitary hunters. What if they weren't, and tended to move around in groups of mixed age-ranges, each with one or two adult-age adults in the mix? All you actually need for this to work is some fairly basic social signalling on the lines of "Me bigger, you smaller. Back down or you're lunch" and dinosaurs capable of suppressing at least some aggression (as large groups of salt-water crocs are capable of doing). What you'd end up with is effectively a mixed eco-species mob, with the little stuff mostly hanging about the big ones for a modicum of protection (a small modicum, as tiny dinosaurs would be on everything's menu), and the mid-range ones acting as the backbone of the hunting group. Add in a big adult which isn't much cop as a hunter as it is too big, but which has an extremely short fuse and very high aggression to pretty much anything, and you have a scenario where the teenage animals hunt and kill, and the adult provides security for the outfit (much as adult male lions do in a pride). I would think that any such grouping would be mostly matriarchal, and males would fit into the scenario only in the mating season; with such ecology females ought to somewhat out-number males (big females would greatly out-number big males) but all of the group would be capable of breeding long before adult size. Is this feasible, or merely fantasy? Varricchio, David J. (2011) A distinct dinosaur life history?, in 'Historical Biology', 23: 1, 91 â 107, First published on: 06 September 2010 (iFirst). David (comment 23): google the term 'ovoviparity'. It is not a one off! Dan (comment 24): firstly, there is limited evidence (from trackways and the association of adult skeletons) for sociality of some sort in big theropods. In other words, it is not true that "everyone assumes" solitary behaviour in these animals: it's likely that they were diverse, with some being mostly solitary, others ganging up when opportunity or circumstance allowed, and others perhaps hanging out in family groups or territory-holding pairs or something. Secondly, what you've just proposed is already in the literature. Based on associated large juvenile and adult albertosaurine tyrannosaurs, Phil Currie has suggested that these theropods lived in social groups with a sort of division of labour (the more gracile juveniles doing most of the hunting). I'm not sure he's right (it seems more likely - and in keeping with other evidence - that different ontogenetic stages occupied different eco-niches), but the possibility of at least occasional gregarious behaviour seems reasonable. People who have said in the past that this sort of thing is unique to mammals need to learn more about birds, squamates and crocodilians. Currie, P. J. 2000. Possible evidence of gregarious behavior in tyrannosaurids. Gaia 15, 271-277. - ., Trexler, D., Koppelhus, E. B., Wicks, K. & Murphy, N. 2005. An unusual multi-individual tyrannosaurid bonebed in the Two Medicine Formation (Late Cretaceous, Campanian) of Montana (USA). In Carpenter, K. (ed) The Carnivorous Dinosaurs. Indiana University Press, Bloomington and Indianapolis, pp. 313-324. Oh, I remember this theory very well when I read it in Dinosaur Heresies as a kid. It never held up very well back then and it sure doesn't today lol! Great article! However, the whole thing about sauropod juveniles living independently from adults seems a little strange to me. I've read that there are sauropod trackways in North America indicate that the sauropod herd was multi-generational, meaning that juveniles were reliant on adults for protection. Could the whole assumption on juvenile sauropods living independently from adults is implied to certain sauropod species (ex. Laurasian vs. Gondwanan sauropods) or sauropods in general? I'm asking this because not all species within a certain clade would engage in the same behavior, especially when it comes to reproduction. Re sauropod packs as evidenced by the sauropod trackways known world-wide. Is there a large range of track sizes within a pack? What is the relative size of the smallest tracks, relative to the largest tracks? I'm just trying to get a sense of what is known about the size/age at which young sauropods joined/formed packs. Anybody real familiar with the ichnological lit? Re: aquatic sauropods - for decades it was assumed, that animals so heavy as mid-sized whales could hardly walk on land. Re: adults and juveniles: I think there is well-publicized trackway of sauropod group with smaller ones in the centre and big ones on the edges, as if adults were guarding the offspring. Different arrangements are possible among extant vertebrates. Many mammals, eg. muskoxen, guard juveniles in the centre of the herd. In contrast, in some birds, non-related juveniles are pushed to the edge of the flock and suffer greater predation. Re: albertosaurine groups. Lions in prides don't benefit from more efficent hunting, but from defense of carcasses, territory and cubs from hyenas and other lions. In theory, tyrannosaurs might develop it further, and largest individuals could be specialized fighters/defanders and smaller ones were hunters. Dinosaur Heresies was revolutionary in as broad sense of first suggesting that dinosaurs were active with sophisticated behaviour similar to birds and mammals, rather than oversized turtles and pythons. Of course, pendulum swings too far in both sides, so dinosaurs were also imagined as too active and mammal-like in many aspects. For example famous Velociraptors opening doorknobs. Heh, this gives me a truly ridiculous idea...eusocial tyrannosaurs! Castes divided up mostly by age--One big queen female, too slow to hunt, a few big males for defense, a bunch of small to medium sized hunters catching the food for all of them. Totally plausible, right? It sometimes occurs to me that Bakker just throws out some half-baked theory just to stir up controversy and the drive to dispute him. In this way he's actually doing a good thing by causing other researchers to sometimes dig pretty deep to get to the truth. Heresis was ultimately good for dinosaur research because it turned dinosaur science totally on its head and forced us to re-think a lot of what had become assumptions. So for all that book got wrong (trunks, viviparity, stegosaurs being a sister group to duckbills, etc.) the central concept--dinosaurs were a lot more complex and derived than we think--was incredibly valuable. "So for all that book got wrong (trunks, viviparity, stegosaurs being a sister group to duckbills, etc.)" Er, Bakker had stegosaurs sister to ankylosaurs (p. 461) as in most phylogenies, with scelidosaurs sister to that. All in all, his phylogeny seems pretty good for 1986. After having read both The Hot-Blooded Dinosaurs and The Dinosaur Heresies (both several years after they were originally published), I was surprised by the fact that Bakker makes no mention whatsoever of Desmond's earlier book - not even in the reference list. I found this is all the more unexpected considering that Desmond was quite generously referencing Bakker's earlier publications in THBD. Darren, do you know why Bakker did not return that favour in TDH? The story is that Desmond became familiar with Bakker's ideas after hearing about them while at Harvard (his office was close to Bakker's). Apparently, Desmond later got a publisher interested while talking about Bakker at a cocktail party. The result: a book that pre-empted Bakker's ideas. According to Beverly Halstead, "To say that Bakker was less than thrilled would be an understatement" (Halstead 1987). Halstead, L. B. 1987. Dizzy dinosaur days - why the party's over. New Scientist 115 (1572), 58-59. Bakker, R. T. 1968. The superiority of dinosaurs. Discovery 3 (2), 11-22. - . 1971. Ecology of the brontosaurs. Nature 229, 172-174. - . 1971. Dinosaur physiology and the origin of mammals. Evolution 25, 636-658. - . 1972. Anatomical and ecological evidence of endothermy in dinosaurs. Nature 238, 81-85. - . 1974. Dinosaur bioenergetics â a reply to Bennett and Dalzell, and Feduccia. Evolution 28, 497-504. Thanks for the explanation, Darren. Exactly. I can understand Bakker's reaction to Desmond's book from a purely human viewpoint, but from a professional viewpoint his refusal to even acknowledge its existence was quite indefensible. By the early seventies, Bakker's main ideas were already out there, published in the literature. Anyone was free to write about them - Bakker himself included. "Re: adults and juveniles: I think there is well-publicized trackway of sauropod group with smaller ones in the centre and big ones on the edges, as if adults were guarding the offspring." I think I remember reading about this too, in the heady early days of the Dinosaur Renaissance. I am pretty sure my source was the book Life Before Man, 1972, by the editors of Time-Life books. (Nothing relevant to the matter in question, but there is a bit about the book here, featuring a rather odd restoration of a stegosaur.) From that, I had gathered that some adult care of sauropod juveniles was given, on the collective herd level if not the individual parent-offspring level. Bakker said in his 1968 Discovery article that the Davenport Ranch sauropod trackway revealed how juveniles had been flanked by protective adults; this claim has been repeated in numerous sources and even illustrated, sometimes with a painting of the trackway as it's meant to look. However, to quote Martin Lockley: "This appealing idea fits in well with the social dinosaur scenario but is only an educated, off-target speculation; there is no trackway evdence for it" (Lockley 1991, p. 79). In discussing what he called the 'structured herd hypothesis', Lockley (1991) showed that (while sauropod herds may have had a complexity) they mostly show the biggest adults (footprint width c. 50 cm) walking ahead of smaller adults/sub-adults (footprint width c. 30 cm). The tracks of small juveniles are never found among herds, and in fact numerous (often associated) juvenile tracks have been found separate from those of larger animals: more support for the 'pod formation' hypothesis (where babies live together, and separately from adults). Lockley, M. 1991. Tracking Dinosaurs. Cambridge University Press, Cambridge. Sorry to nitpick, but shouldn't it be 'Beverly'? "To say that Bakker was less than thrilled would be an understatement" (Halstead 1987). That quote intrigued me so much that I had to look up Halstead's review of The Dinosaur Heresies in New Scientist. It turned out to be even more hostile than I had thought. (I already knew that Halstead was not a fan of the 'dinosaur renaissance'; in 1976, he had reviewed - in Nature - Desmond's book almost equally harshly.) A reminder of the fact that even in the mid-eighties, there was still some mainstream resistance to Bakker's ideas. Thanks for reminding me of that one. It's a peculiar and somewhat overlooked item in the dinosaur literature, even though (or because?) it was actually pretty ground-breaking. Yes, it's Beverly, my bad. > The human is meant to be Robert Bakker. growing consensus... that dinosaurs were physiologically unique - neither ectothermic like modern reptiles nor endothermic like birds and mammals. I always took that to mean "Well obviously Bakker's not totally wrong, but I still refuse to admit he's right about anything." Well, there actually was such a growing consensus in... hm, maybe not in 1996 anymore, but not much earlier. I have long suspected that this is a general phenomenon. Usually in science everything turns out to be more complicated than people thought at first; therefore, many scientists tend to go against the principle of parsimony (especially in fields close to but outside the particular field they work in) and embrace hypotheses that look more complicated and less reductionistic than the latest "radical" idea. A clear example of this is the concept that the K-Pg mass extinction had many separate causes that happened to occur at (about) the same time. It has been largely abandoned, but it took twenty years for most people to understand that the impact alone really can explain everything just fine and additional hypotheses are simply not needed. I'm always uncomfortable with the assertion that such-and-such a physically possible trait *could not* evolve in a given lineage. Evolution has done too many surprising things for such an argument to be convincing. It does not say that viviparity "could not" evolve. Given the vast diversity of extant birds, and the absence of viviparity in any of them (as opposed to squamates) it seems to me highly unlikely that archosaurs could evolve viviparity. Also, a piece of historical accuracy. Adrian Desmond's office wasn't near Bob Bakker's (picture looks *nothing* like the young Bakker BTW) --- Bakker was in the new wing of the Museum of Comparative Zoology with the Fuzz Crompton/Farish Jenkins crew. His office was near those of Ken Rose, Dan Fisher, John Fleagle, and myself. Thanks, Christine: fair enough, I was just parroting what Halstead said.